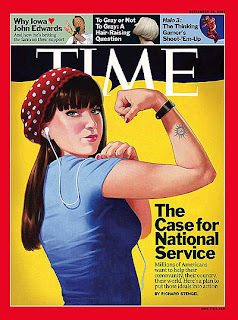 This week's headline article for TIME is The Case for National Service and for the most part I really enjoyed it. TIME calls for our next President (hopefully Barack Obama, in my opinion) to encourage our nation's citizens to be involved in service to our nation and to our world. "Devoting a year or more to national service," says the article, "whether military or civilian, should become a countrywide rite of passage, the common expectation and widespread experience of virtually every young American." The article does a good job of collecting thoughts on creating a Department of National Service and even a U.S. Public Service Academy, the later also suggested by Hillary Clinton and others. I couldn't agree more that Americans of all ages should give two years of service to their community, whether they consider it their world community or neighborhood community. You can serve in schools through Teach for America, in local communities building houses through AmeriCorps, or in grass huts through Peace Corps. All are paid for and only require your time and your effort. I was thrilled to see your headline article this week was National Service, but I was very disappointed to see that Peace Corps only received a sentence and a John F. Kennedy picture on the first page. Over 187,000 Peace Corps Volunteers have answered the call since 1962 not only to "ask what you can do for your country" but to "ask what together we can do for the freedom of man." Next time please give Peace Corps more than a mention. It is currently the fifth "most ideal employer" for college graduates and there is a reason why. Whether or not it is published, I hope the magazine sees my point. I appreciate what they are doing and I think a lot of wonderful organizations are helping our country and our world in great ways. I am proud to be taking part in one of our country's proudest moments, I think, and I hope it remains a moment we live in for a very long time.